At the Sixth Annual Veterans Day Festival, northwest Houston area’s largest master planned community and friends will join together to honor local veterans. Explore the Honor Wall of Bridgeland Veterans and family members and learn about the contributions of Bridgeland Veterans. 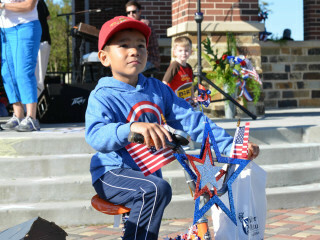 Participants can show their patriotism by entering various contests including a Bicycle Decorating contest, a Sidewalk Chalk Drawing contest and a singing competition. Entertainment will be provided by local soul band, Commercial Art, from 3-5 pm. The event will also include a car show, a bounce house, face painting and more. The Veterans Day Festival is hosted by The Bridgeland Community Supports Veterans, Inc., a non-profit organization that seeks to construct The Veterans Memorial at Bridgeland. 16919 N. Bridgeland Lake Pkwy.